Launchpad couldn't import bug #38737 from freedesktop.org Bugzilla. 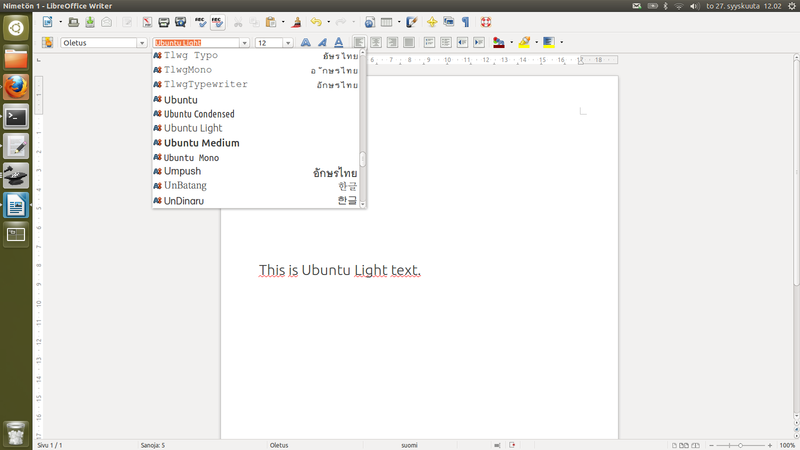 See comments on wrong "Ubuntu Light" font family being specified in the information of Ubuntu-M.ttf. Attached to this bug report is also a branch of the Ubuntu packaging that includes this manually modified Ubuntu-M.ttf, since the sources seem not to be editable with free tools. 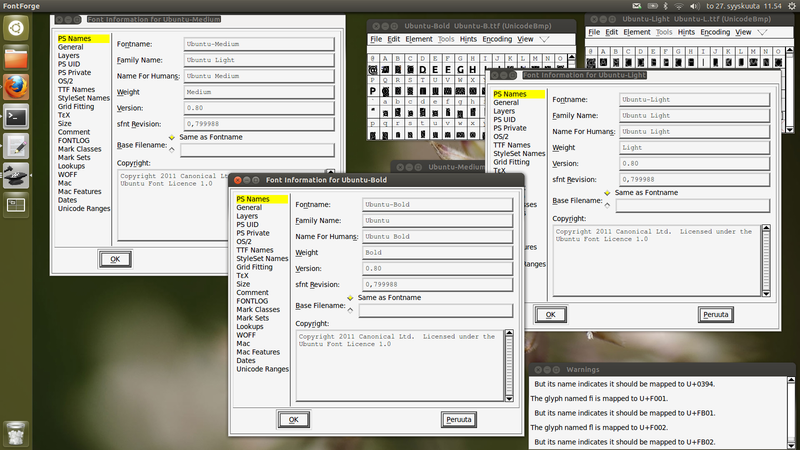 If I install this font and choose "Ubuntu Light" in LibreOffice, it actually picks the "Medium" font weight. If I remove the medium font weight files and restart LibreOffice it chooses the right weight again. It seems related to bug 744812. Regarding the fonts themselves, I can see that the Ubuntu-M.ttf's "Family Name" says "Ubuntu Light". Fontname and name for humans are Ubuntu-Medium & Ubuntu Medium. More inconsistencies include that Ubuntu Light has all Fontname / Family name / Name for Humans as Ubuntu-Light or Ubuntu Light, where as the Ubuntu Bold has family name only "Ubuntu". As the last possibile thing to check is Styles (SubFamily) setting in TTF Names, which is "Bold" for both Ubuntu Medium and Ubuntu Bold, and "Regular" for Ubuntu Light. I set the Family Name for Ubuntu-M.ttf to Ubuntu Medium, which seemed to fix the problem (screenshot attached). 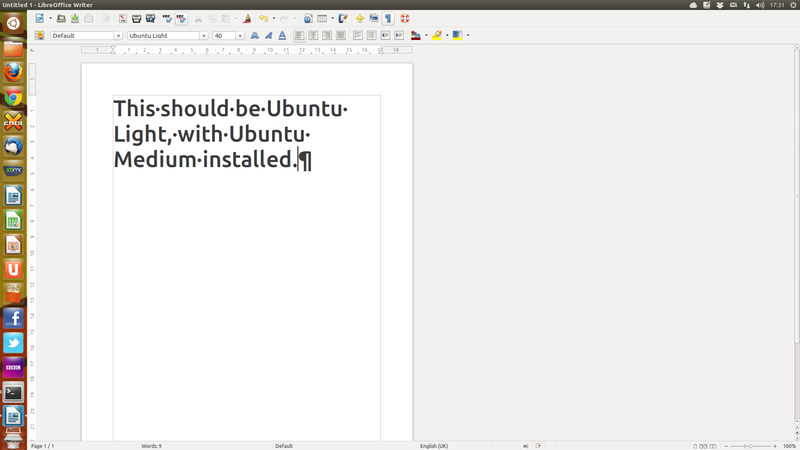 Ubuntu Medium now also appeared in LibreOffice's font list as a separate entry. After all, it apparently is that the bugs do exist in programs/libraries, but font makers mostly have workarounded them. Liberation reportedly has some similar issues. In broad terms there is the simple metadata (fontname + boolean for italic + boolean for bold); and there is the complex metadata (name, family name, numerical slant, numerical weight, …). Various applications; including FontConfig IIRC makes errornous presumptions when mixing those. Adding that to FontConfig as an available matching spec would at least allow debugging by canonically knowing what you're getting. So this seems from reading the comments to be a bug in fontconfig, which could be workarounded in the Ubuntu font. While LibreOffice shows the buggy behaviour, it needs to be fixed in fontconfig or worked around in the Ubuntu fonts. Is that correct? the situation upstream changed between 3.6 and master (hopefully for the better). Anyway, can I close this one for quantal as wontfix now? Looking at the upstream git log  the fontconfig part should be fixed since saucy. A pango & fontconfig fix is underway, should help. Also, libreoffice 4.3 contains a related enhancement. Came across this bug today because I cannot use Ubuntu Medium/Bold correctly in neither Libreoffice (5.1.4-0ubuntu1) nor Inkscape (0.91 r13725) under Kubuntu 16.04. The System was installed from scratch and updates are recent. I have tried the ttf-ubuntu-font-family/xenial package (0.83-0ubuntu2) as well as downloaded Versions from both font.ubuntu.com (0.83 too) and fontsquirrel.com. In LOO I get all weights under the "Ubuntu" Family entry, except "Medium" -- interestingly Light Italic/Italic/Medium Italic/Bold Italic are there and working! Non-Italic only Light, Regular and Bold show up as Styles. There is no separate Light/Medium Family, only Condensed and Mono. In Inkscape, otoh, I have Medium/Medium Italic, but no Bold styles. All available Styles are rendered correctly, i. e. "Regular" is normal, not Medium, etc. In Inkscape I can get a text set to correct Bold style if I enter "Bold" in the Style Dropdown manually. I am sure this is supposedly not the correct place to put this report - maybe someone can point me somewhere better. Maybe it is a regression, though. A quick look into Ubuntu-M.ttf showed the "Ubuntu Light" thing, and I have also read Bug 744812, but found it it also quite dated and complex.